This past Thursday's post was a list of the desserts I traditionally make for Thanksgiving. Lots of people have since commented that pumpkin pie was missing from the list. Although pumpkin pie is an American classic, it's not our family's favorite. Actually, there's only one of us who really likes it and only a few of us who tolerate it, assuming it's mounded with whipped cream. So, we don't have pumpkin pie. 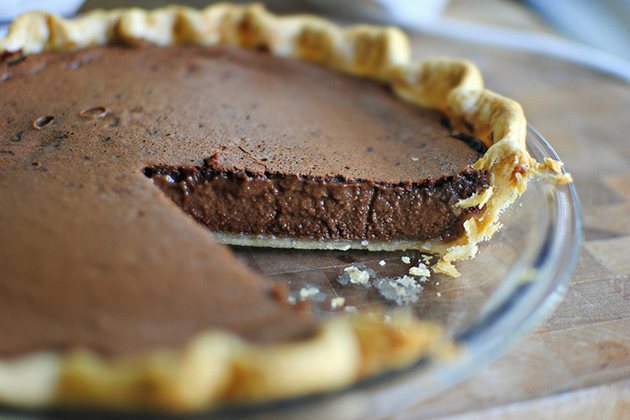 We have chocolate pie instead. This pie is so yummy and so simple to make, I thought I'd share the recipe. And then I realized, I already have! Here's a link to a 2014 Thanksgiving post where you'll find the recipe. I'm proud to say that over the last few years, I've cut back on the number of desserts we take to Thanksgiving and for the last two years, not a single tear has been shed! Hope I didn't just jinx myself. Yikes! Stay tuned for the other recipes mentioned in last Thursday's post.